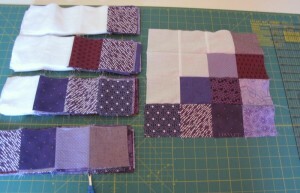 Other posts on this project: That’s a Lot of Purple. 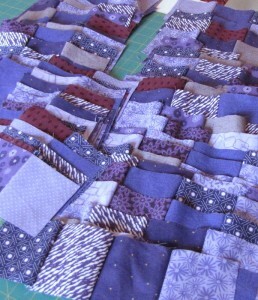 I’ve cut out all the pieces for this quilt, which I’m still keeping a secret. I’ve sewn 100 rows of 4 squares together, and now I’m working on piecing the rows of 4 into 16 piece blocks. I need to finish it this week, so hopefully now it will come together pretty quickly.